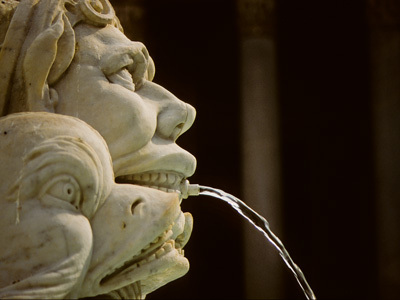 Fountain, Rome, Italy. Canon A2E, Fujichrome, 1992. La Padrera / Casa Mila, Barcelona, Spain. Designed by Anotoni Gaudi and built between 1906 and 1910, the world famous Casa Mila was recognized by UNESCO in 1984 as a World Heritage site. Canon A2E, Fujichrome, 1997. Street musician, Barcelona, Spain. Canon A2E, Fujichrome, 1997. Mime, Barcelona, Spain. Canon A2E, Fujichrome, 1997. Moderno Fountain, St. Peter's Square, Rome, Italy. Redesigned by architect Carlo Moderno in 1612-1614, the fountain uses no pumps and operates purely by gravity. Canon A2E, Fujichrome, 1992. Trevi Fountain, Rome, Italy. The largest Baroque fountain in Rome, Trevi Fountain was started as a renovation of an earlier fountain in 1629 by Gian Lorenzo Bernini. It was completed in 1762 by Giuseppe Pannini. Canon A2E, Fujichrome, 1992. Coliseum, Rome, Italy. Originally called the Flavian Amphitheater, the Coliseum is considered one of the greatest works of Roman architecture and Roman engineering. Canon A2E, Fujichrome, 1992. Chillon Castle, Montreux, Lake Geneva, Switzerland. Built in the 11th century, Chillon Castle was memorialized by the poet Lord George Byron (1788-1824) in his poem "The Prisoner of Chillon". Canon A2E, Fujichrome, 1994. Temple de la Sagrada Familia, Barcelona, Spain. Designed by Antoni Gaudi, Sagrada Familia has been under construction since 1882 and is not expected to be completed until at least 2026. Canon A2E, Fujichrome, 1997. Coliseum, Rome, Italy. 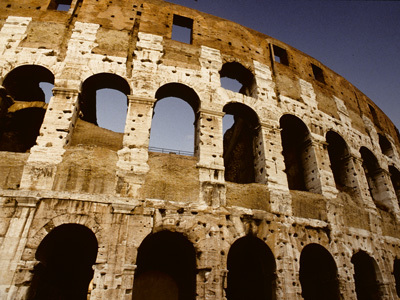 Originally called the Flavian Amphitheater, the Coliseum's construction was started in 70 A.D. under Emperor Vespasian and completed in 80 A.D. under Emperor Titus. Canon A2E, Fujichrome, 1992. Trajan's Column and Foro di Traiano, Rome, Italy. Trajan's Forum was constructed on orders of Emperor Trajan and was inaugurated in 112 A.D. Trajan's Column was inaugurated in 113 A.D. Canon A2E, Fujichrome, 1992. St. Peter's Basilica, Rome, Italy. Originally designed by Donato Bramante and later redesigned by Michelangelo, the Dome of St. Peter's was completed in 1590. It is the tallest dome in the world and rises 448 ft. from the floor of the basilica to the top of the external cross. Canon A2E, Fujichrome, 1992.